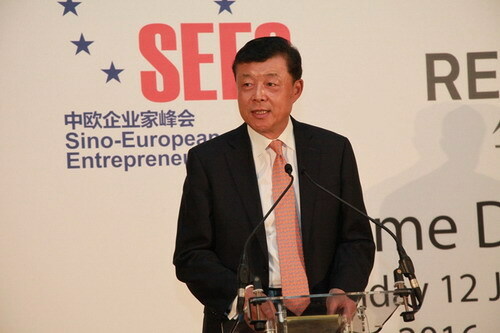 First of all, my warm congratulations to the Seventh Sino-European Entrepreneurs Summit and warm welcome to Chinese and European business leaders. l and in China's economic prospects. First, I can see from this summit your strong confidence in China-Europe business cooperation. Europe plays a very important part in China's overall external cooperation. l It is China's largest trading partner. l It is our biggest source of technology import. l It is China's 4th largest source of foreign investment. l It is at the same time an important destination for Chinese investment. At present, the Chinese economy is making steady progress. European economy is gradually walking out of the debt crisis towards recovery. China's "Belt and Road" initiative opens new horizon for China-Europe cooperation. If China and Europe can join hands to advance the "Belt and Road" initiative, this will create new opportunities and further growth for China-Europe business cooperation. 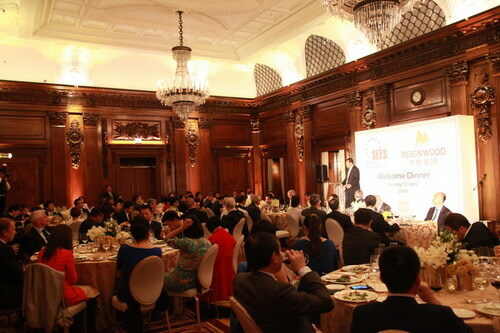 Second, the summit is a show of your strong confidence in China-UK business cooperation. The business relationship between China and Britain is an epitome of China-Europe cooperation. In many aspects it is leading the way for China-Europe cooperation. l The UK is China's second largest trading partner inside the EU. l While China is Britain's second largest trading partner outside the EU. l More than 500 Chinese companies established a foothold in this country. l The UK has become a major investment destination for Chinese businesses. One of the highlights is China-UK financial cooperation, which has been making unprecedented progress. London is now the world's largest RMB offshore market outside China. British and Chinese governments have in succession issued RMB sovereign bond in London. With China-UK relations entering a "Golden Era", both countries are working to achieve more "golden results"
Third, the summit also signifies your strong confidence in China's economic prospects. China's economy is what we call a "new normal"- namely, a period of slower and steady growth for better economic structure and quality. The positive factors, such as strong economic resilience and untapped market potential, are still available for further growth. China is still half way towards industrialization and urbanization. Its consumption structure is in a crucial transition. New economic drivers are being created to replace old ones. China will carry on the structural reform and focus on creating new growth engines. This will enable China's economy to complete this transition cycle and sustain the medium-to-high growth. The future of China's economy is bright. Last but not least, I hope tomorrow's summit will serve as a good platform for in-depth dialogue and discussions over a number of subjects, including the "Belt and Road" Initiative, overseas investment and acquisition, innovative cooperation, creativity industries, etc. I hope the summit will result in closer cooperation between Chinese and European businesses and deliver concrete results. I hope the summit will contribute to a stronger business relationship between China and Europe.